I am obliged at the present juncture to proceed through each of these, for I wish to record the life of the wonderful Baradatos;1 for he too has devised new tests of endurance. First, immuring himself for a long time in a cell, he enjoyed divine consolation alone. From there repairing to the ridge situated above, and constructing out of wood a small chest that did not even match his body, in this he dwelt, obliged to stoop the whole time - for its length was not equal in size to the height of his body. It was not even fitted together with planks, but had openings like a lattice, and was similar to windows that have rather broad openings for the light; because of this he was neither safe from the assault of the rains nor free from the flames of the sun, but endured both of them like the other open-air ascetics, whom he surpassed only in the labor of reclusion. Having spent a long time in this way, he later came out, yielding to the instances of the inspired Theodotos, who had been appointed to the episcopal see of Antioch.2 However, he stands all the time, stretching out his hands and hymning the God of the universe, and covering his entire body with a tunic of skins - only round the nose and mouth has he left a small opening for breath, in order to receive and inhale the common air, since otherwise human nature cannot live. He endures all this labor, even though with a body not robust but much afflicted by numerous ailments; but his bubbling zeal, inflamed by divine love, compels to labor one who cannot labor. Adorned in mind with understanding, he is excellent at composing questions and answers; he sometimes syllogizes better and more powerfully than those well versed in the labyrinths of Aristotle.3 Although he is at the very summit of virtue, he does not allow his spirit to soar above, but orders it to crawl below at the skirts of the mountain, for he knows what harm is incurred by an understanding swollen with vanity. Such, in summary, is this man's philosophy. May it be that it so increases as to reach the finishing-post of the race, for the glory of these victors is the common joy of the pious. For me may it be that, supported by the prayers of these men, I do not get far from this mountain, but ascend it gradually and luxuriate in gazing upon them. 1. 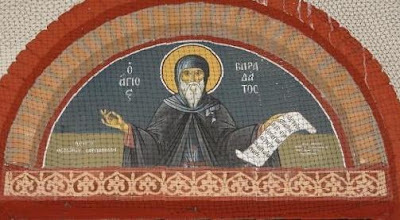 Baradatos (Varadatos) was a hermit in the region of Antioch who lived at first in a cell, and then inside a chest till dissuaded by Bishop Theodotos of Antioch. He subsequently practiced perpetual standing. 2. Theodotos was bishop of Antioch in the 420s. 3. Cp. Theodoret, Cure of Hellenic Maladies, "Those who know the Persians report that they are extremely skillful at syllogisms and are capable of refuting the complex arguments of others ..., not because they have read the labyrinths of Chrysippus and Aristotle ..., but they have had nature alone as their teacher." With the rivers of your tears, you have made the barren desert fertile. Through sighs of sorrow from deep within you, your labors have borne fruit a hundred-fold. By your miracles you have become a light, shining upon the world. 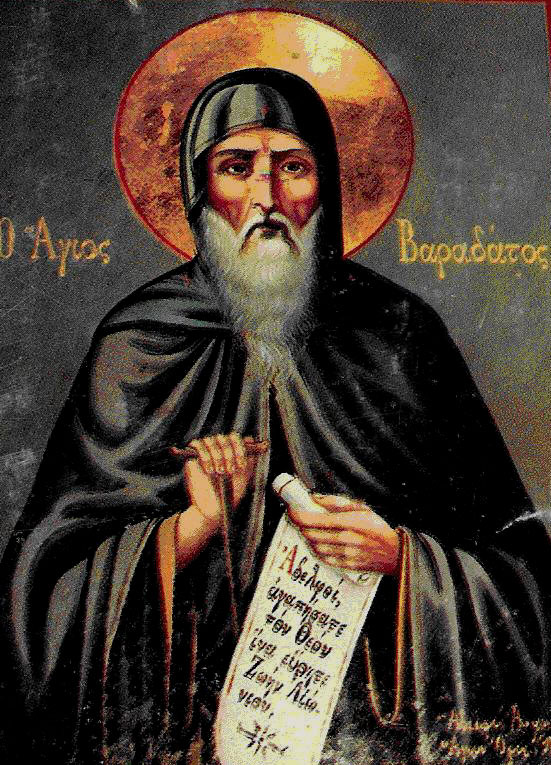 O Baradatos, our Holy Father, interceded to Christ our God, to save our souls. Rejoice, wise Father Baradatos, you who imitated the life of Angels; rejoice, our mediator before the Master, and intercede that He may save us, we who praise you. To the west of Proussa in Asia Minor, near the town of Kouvouklia, there was a shrine to Saint Baradatos. 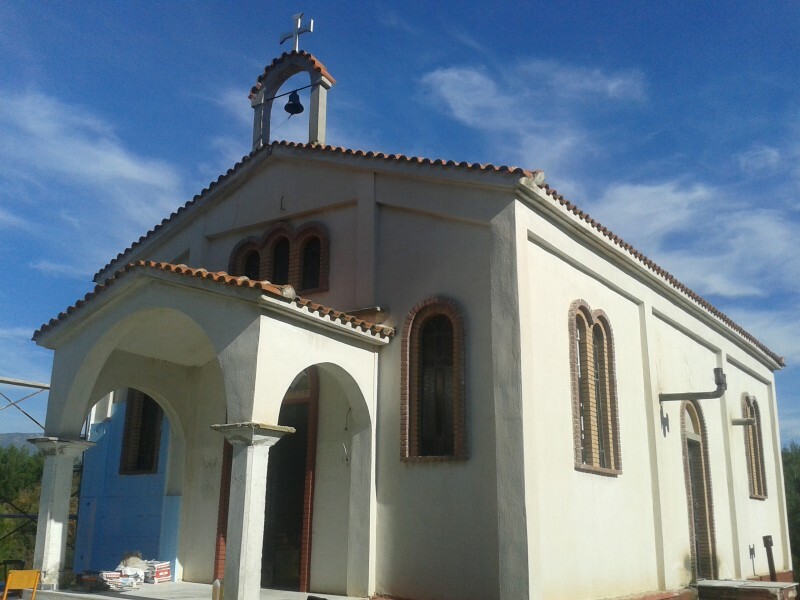 Refugees from Kouvouklia who settled in the region of Kozani, with faith and piety built a sacred chapel in Roditis on the shores of Lake Polyfytos dedicated to Saint Baradatos. This chapel celebrates with a Great Vespers and Artoklasia on the eve of his feast on February 22nd, and on the day of his feast there is Matins and a Divine Liturgy in the presence of many people from Serbia, Kozani, Ptolemaida and of course Roditis. It should be noted that on the grounds of the chapel is a Memorial to the Asia Minor Catastrophe.